Twins' bullpen catcher Amundson -- No. 75 -- gets an insider's look at life as major leaguer. Aron Amundson comes to a major league ballpark every day, dresses and showers in a major league clubhouse, wears a major league uniform, and catches major league pitchers for living. Yet, he has the same chance of appearing in a major league game as that middle-aged guy in the upper deck with a bad back and beer gut. Such is the life of a bullpen catcher -- so close, yet so far away. 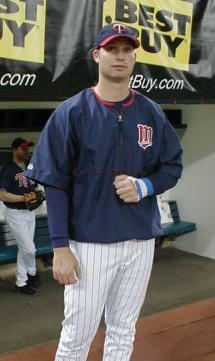 Amundson became the Twins bullpen catcher in 2001 after spending two summers playing in independent leagues. "I had a contract with Springfield (of the Frontier League), but I wasn't sure I wanted to go back," the 26 year old explained. "I got a call from Rod Fornasiere, an assistant coach at the U of M, and he told me that that he had gotten a call from (Twins GM) Terry Ryan and said they were looking for a bullpen catcher. Rod gave (Ryan) my name and told him I'd be a good person for the job. I went in for an interview the next day and they gave me the job." Remarkably, Amundson had never caught before. During a well traveled college career, that included stops Eastern Oklahoma State, Oklahoma University, and the University of Minnesota, Amundson had split time at first and third base as well as pitcher and designated hitter. "He's done a very good job for someone that has never caught before," longtime Twins bullpen coach Rick Stemaszek said of Amundson. "It took him a little while to catch on about how things work at the major league level, but he's done that he's learned how we do stuff on a daily basis." While he is not officially a member of the team, Amundson does enjoy some major league perks; he travels on the team charter, stays in five star hotels, and receives the same travel per diem as the players. "(The meal money) helps out a lot at home," he commented. For the most part, the players treat him like one of the guys, "We hang out all the time," the North Dakota native said. "Every once and awhile, we'll being going back the hotel and someone will say 'hey, let's go get something to eat' that kind of stuff. They are great guys." "I usually hang around the pitchers," Amundson went on to say. "During the game, I am down there (in the bullpen) for three hours with those guys, and baseball gets kind of slow at times. We play little games down there and get to chatting about a little bit of everything." Being in the bullpen makes him an easy target for hecklers, many of whom notice his unusual number. "My number is 75 a bigger number some fans don't really realize that I am not a player," Amundson explained. "They think I am just one of the guys. They seem to rip me about my number, one guy told me I looked like an offensive lineman I just said 'hey, what's your number buddy?' and he shut up." According to Amundson, the large amount of travel is the best and worst part of his job, "One of my favorite parts is seeing the stadiums," he said. "Sometimes the travel gets a little long, towards the end of the season you are kind of burnt out from all of the road trips. The three city trips get a little long, by the end of the second city you are ready to go home." "My wife has a hard time with me being gone so much, but she gets to go on one road trip a year," Amundson explained. "Last year for the playoffs, she got to go on the of the trips." During his first tour around the league in 2001, Amundson decided to take a unique souvenir from each stadium the Twins visited. "I got a little bit of dirt from the left-handed batter's box," he explained. "Actually when we moved into our house it got stuck up in the attic I still have it." The most difficult part of a bullpen catcher's job is warming up pitchers in stadiums like the Metrodome, where the bullpen is not sectioned off from the field. "When you catch in the bullpens that are right on the field, if you miss one it will almost hit the umpire. But, most of the time I will blame it on the pitcher," Amundson joked. His home park is particularly perilous, "In the Metrodome, the fans are right on top of you, the background is really bad," he explained. "The pitcher is throwing a white ball right out of white T-shirts. That is probably the most stressful part of my job." While the most visible part of his job is warming up pitchers during the game, most of Amundson's work is done behind the scenes. "During the first two or three groups (of batting practice) the bullpen guys throw little touchups, so I will catch one to five guys a day during batting practice," he said. "Before batting practice, most of the time I catch the starting pitchers, who are throwing on the side. That can be anywhere from 15 minutes to a half hour of throwing. I do 75% of my work before batting practice even starts." Once an aspiring big league player himself, Amundson battled with the reality that his playing career was over at first. "My first year I really struggled with (not being able to play), because I was used to playing everyday," he explained. "I wanted to take BP everyday. I'd throw BP and I'd try to throw real hard and all of that kind of stuff wears on your body so much that you have to take it easy." Despite the intial frustration, Amundson never lost sight of how fortunate he is. "I love my job," he said with a smile. "I get to come to a ballpark everyday, and I get paid to play catch for a living." This story appeared in the July 11, 2003 issue of Let's Play Softball/Baseball Magazine.